Urinal – Where to take a leak in the Old Town? We don’t talk or give them much thought until we really need to use one, right? Well, many would agree there are not enough public toilets available in Stockholm. Especially not in the Old Town, a small island that becomes very crowded during the summer season. 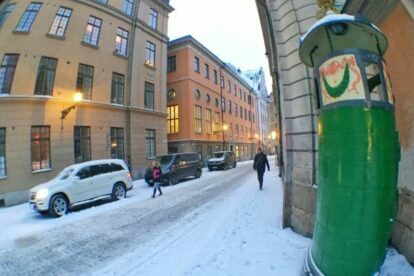 The politicians in Stadshuset, the City Hall, are promising another 60 toilets to be installed around the city within the next couple of years, many of which will be free of charge and automatically cleaned after use. Men have slightly more options where to find relief as there are several urinals found around the city. My favorite is located next to the former Stock Exchange building, close to the Royal Palace and the Cathedral. It happens to be the oldest in Stockholm, installed in 1890. It actually looks like a guard post where one of the Royal Guards in charge of standing guard outside the Royal Palace might find refuge from the cold wind. Women have several other options around the Old Town but should keep in mind that most public toilets are not free and require 10 kr to be deposited before the door will unlock. For iPhone users there’s an app, HittaToaLätt, that provides a map to toilets and urinals in Stockholm.